National Mechanisms are officially established bodies that include representatives from different areas of government relevant to the prevention of atrocity crimes. They are established to lead the development of a coordinated national strategy for the prevention of such crimes on behalf of their government. The 2016 edition of the Booklet is comprised of three sections, the first of which lays out important updates to National Mechanisms featured in the previous year’s edition, including those of the Democratic Republic of Congo, Kenya, Tanzania, Uganda, Paraguay, and the United States. After reviewing the progress of these existing bodies, the second section then introduces newly established National Mechanisms in South Sudan and Costa Rica. The third section begins with a case study that gives an overview of the reparations process underway in Ecuador, which has come as a result of the findings of the country’s Truth Commission. While Ecuador does not yet have a National Mechanism, these efforts may work to facilitate the establishment of one in the future. The third section then continues with a segment that examines common challenges encountered by National Mechanisms and highlights innovative solutions that have been enacted to resolve them. Finally, the booklet ends with conclusions and lessons learned, which provide valuable insight for countries seeking to establish their own Mechanism. 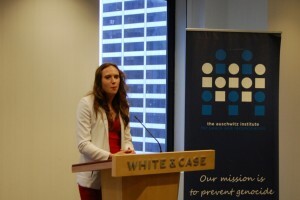 The Booklet’s launch event featured remarks by Samantha Capicotto, AIPR’s Director of Policy and Planning and primary author of the publication, Owen Pell, Partner at White & Case, and Mario Buil-Merce, Political Affairs Officer at the UN Office of the Special Advisers on the Prevention of Genocide and the Responsibility to Protect (OSAPG). Speaking first, Ms. Capicotto introduced the new edition of the Booklet and gave a brief overview of AIPR’s objectives in producing the annual publication. She proceeded to give an overview of the Booklet’s contents, introducing the two new National Mechanisms and noting the inclusion of Ecuador and its reparations process as a potential forerunner to the establishment of a National Mechanism. 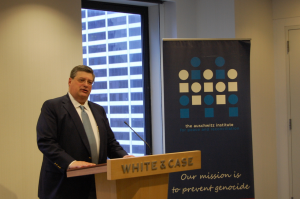 Mr. Pell took to the podium next to speak about White & Case’s longstanding support for the Auschwitz Institute as well as the importance of producing the National Mechanisms Booklet to the developing field of genocide and mass atrocity prevention. For him, efforts that place an emphasis on fostering transparency and dialogue are essential to the continued growth of prevention efforts. To this end, he explained, the Booklet promotes dialogue among and between relevant actors over how National Mechanisms are designed and how they are made successful through their integration into existing governmental systems. Speaking next, Mario Buil-Merce spoke about the importance of National Mechanisms to the work of the OSAPG. He clarified that, to the Office of the Special Advisers, the most significant elements of the newest edition of the booklet are the emphasis that it places on durability and the evidence it shows of a continued political and financial commitment made by states to National Mechanisms. 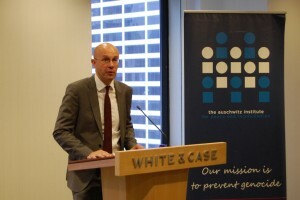 Mr. Buil-Merce also highlighted the fact that supporting the work of National Mechanisms is not only about helping states to create and sustain these bodies, but also about respecting national ownership and helping Mechanisms to operate in conjunction with regional organizations and civil society. The 2016 Booklet on National Mechanisms for the Prevention of Genocide and other Atrocity Crimes can be accessed from AIPR’s publications page or by clicking here to download it directly. If you have any questions about the booklet or would like more information on the Mechanisms contained within, please contact Samantha Capicotto at samantha.capicotto@auschwitzinstitute.org.